Select black tea expertly blended with Kenyan and Assam teas to deliver a traditional tea taste with a rich taste and hearty aroma. 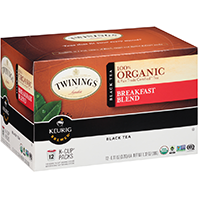 Twinings Organic & Fair Trade Teas are hand selected from the world’s finest tea gardens and made without any artificial ingredients for a natural and wholesome tea experience. By choosing a Fair Trade Certified tea, you are directly contributing to the livelihood of tea growing communities and promoting a just form of trade with the developing world. 72 Count $56.70 $53.70 On Special!